Some links before I get started today. Parsnip had the Square Dogs front and center at her blog. Cheryl wrote at her blog about Labor Day activities. Krisztina had a recipe at her blog. The Whisk had this epic cuteness. And Mark has some news on an upcoming book. 8:45 AM. Awake in my quarters. Late night out last night. Gambled in a game of chance against some dwarves from Nidavellir. Apparently they take it personally when someone cheats. Had to teleport my way out in a hurry. I'm sure that won't come back to haunt me. 9:10 AM. Down at the banquet hall. Volstagg is busy plowing through enough breakfast to feed ten Asgardians. I ask him where he puts it all. 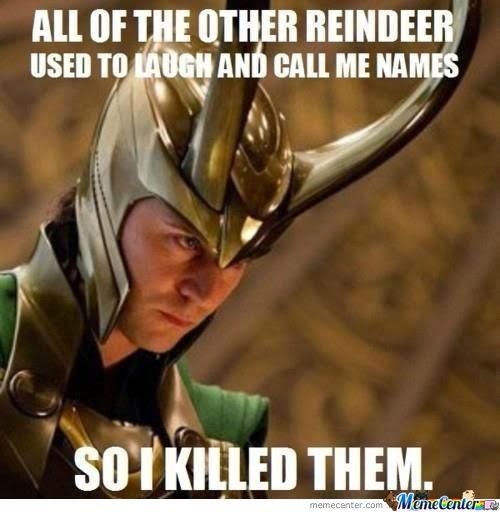 He merely glares back. 9:35 AM. Eating breakfast. Told some brats that they were rock trolls. Apparently Volstagg's children took exception to being called rock trolls and went off to tell daddy. Hogun tells me Volstagg is looking for me. 10:05 AM. Coming to see Father and Mother in the throne room. Father expresses misgivings about claims made by dwarves from Nidavellir that an Asgardian prince cheated them in gambling last night. Really, Father, I have no idea what they're talking about. 10:10 AM. Mother gently reproaches me to behave myself. 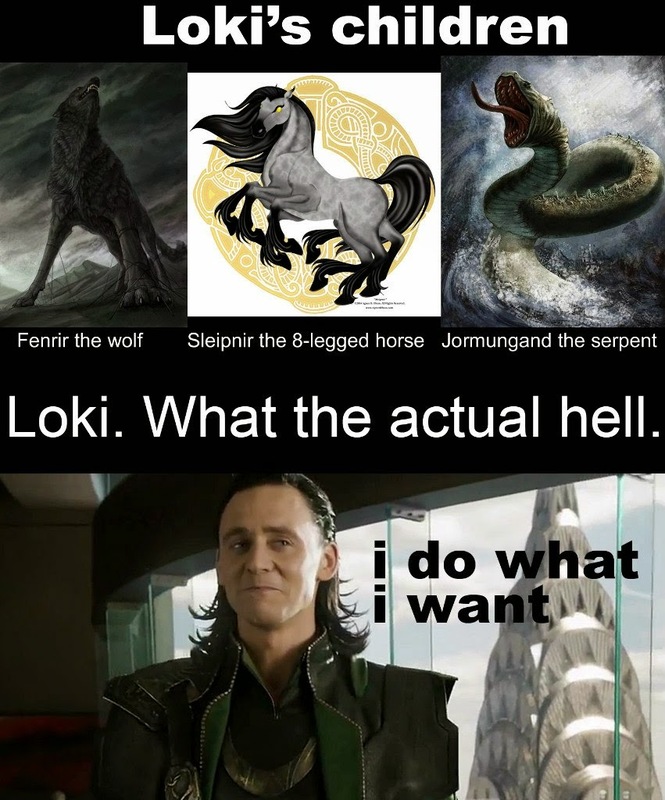 Mother, really, if I behaved myself, would I really be Loki? She must admit that is not the case. 10:47 AM. Sif and I part ways. 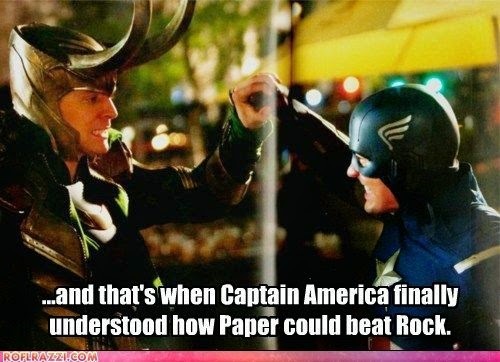 It's been awkward between us ever since that one night stand, as the Midgardians call it. She likes to pretend it never happened, avoids making eye contact, and treats me with general suspicion. If you ask me, she's trying not to think of the fact that one night with the trickster Loki will make everyone else pale in comparison. What can I say? I'm not modest. 11:50 AM. 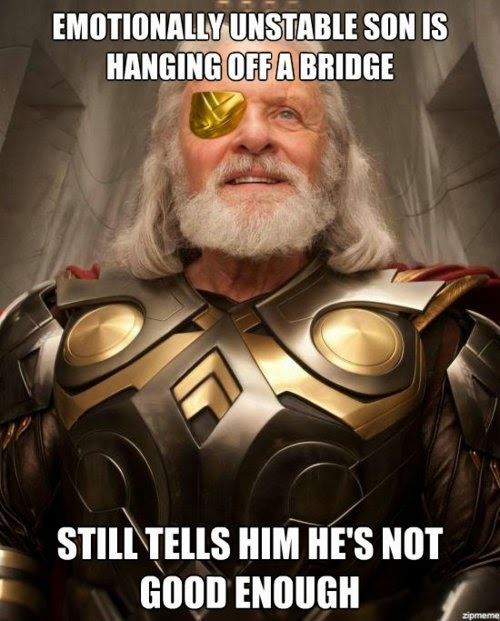 Come out to the Bifrost bridge to see Heimdall. I ask if the dwarves are gone. He informs me they're still hanging around. Oh, that can't be good. 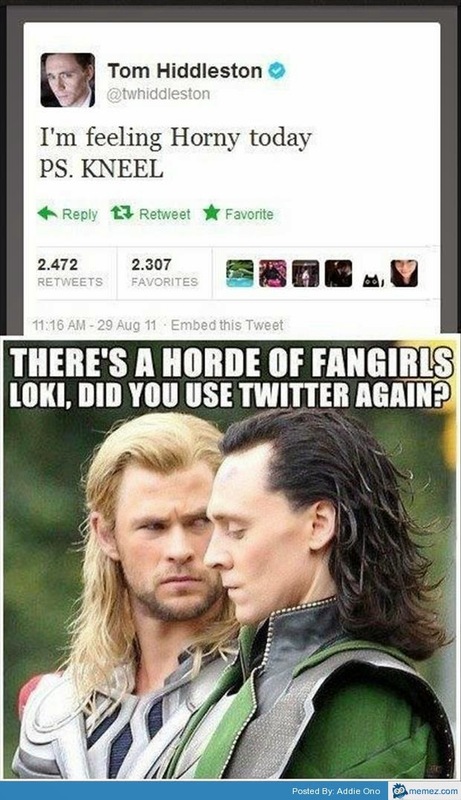 Say, Heimdall, if anyone asks, could you say I went down to Midgard? 12:05 PM. Returning to my quarters is thwarted. I am just around the corner when I hear dwarves down the hall arguing with Fandral. They must be at my door. Well, I'll just go the other way nice and quiet. It's not as if dwarves will hear me going, right? 12:07 PM. My escape is complicated by the arrival of Sigyn. She's definitely looking unhappy with me. What is it with ex-wives and frowns? 12:08 PM. Yes, yes, yes, I know, Sigyn, whatever you say, I agree with whatever you say if it means I can get out of here so much the faster. Say, I don't suppose we could discuss this somewhere else? There are a few dwarves upstairs who seem to be a bit annoyed with me right now. 12:12 PM. Having a midday meal. Tyr stops by and tells me Queen Karnilla of the Norns has shown up and demanded my head on a pike. What did I do to deser...oh, right, swindled her out of the Norn Stones. 12:30 PM. 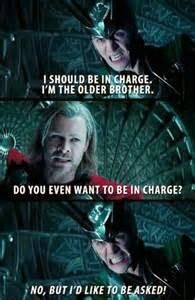 Thor tells me Father expects me in the throne room immediately. Tell me, brother, am I in trouble? 12:35 PM. Thor and I arrive in the throne room. Karnilla and a group of dwarves are present and accounted for. All of them look quite annoyed with me. No sign of Surtur, but it's not as if that monster will ever be allowed into Asgard. Father doesn't look amused. 12:36 PM. I inform Father that I wasn't actually stealing the Norn Stones. I was just having them cleaned, it was all a big misunderstanding, and we shouldn't let a misunderstanding get in the way of good relations with Nornheim, should we? 12:40 PM. Karnilla appears dubious, but is willing to give me the benefit of the doubt. She does caution me though on one thing, saying that if I should ever lie again, a giant green beast will one day bash me around like a rag doll. Oh, good, one down, two to go. 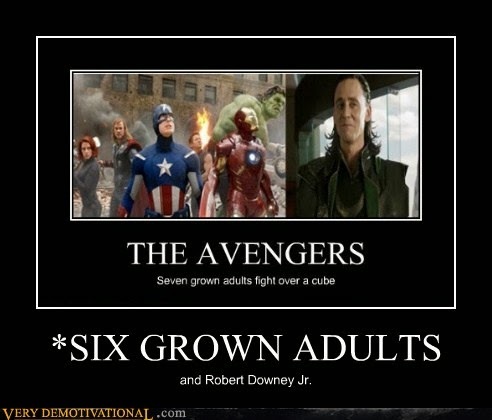 I can outwit those dwarves with half my brain tied behind my back. I wonder what that expression means. 12:42 PM. I begin to tell the story of how Thor and I once rescued a group of child dwarves from rock trolls, and how my opinion of dwarves in general has always been in great esteem. I then proceed to start embellishing on the story; this may take awhile. The entire point of this is to make the dwarves forget what they were angry about in the first place. 7:55 PM. Finally finished my long, drawn out story about dwarf children, rock trolls, mystic journeys through unknown lands, and the billy goat curse on the Chicago Cubs. 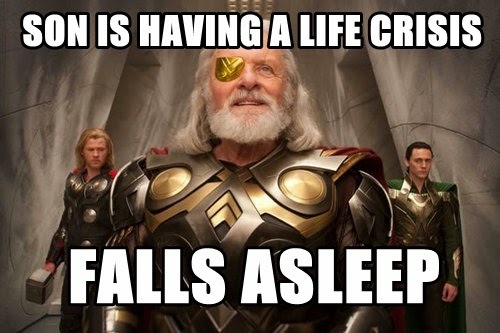 Most of the dwarves have fallen asleep. 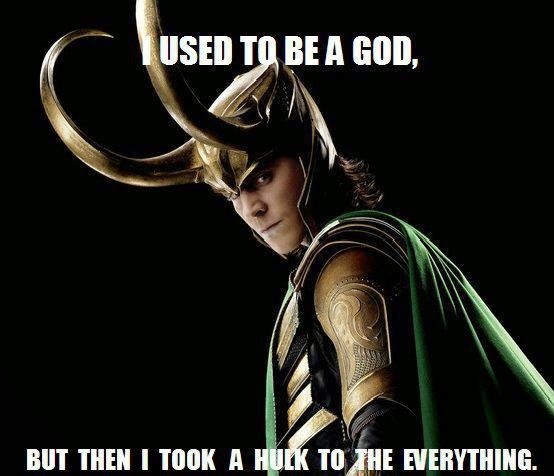 A good number of Asgardians have done the same. I look around and bellow "the end." Everyone wakes up. The dwarves look around, confused. 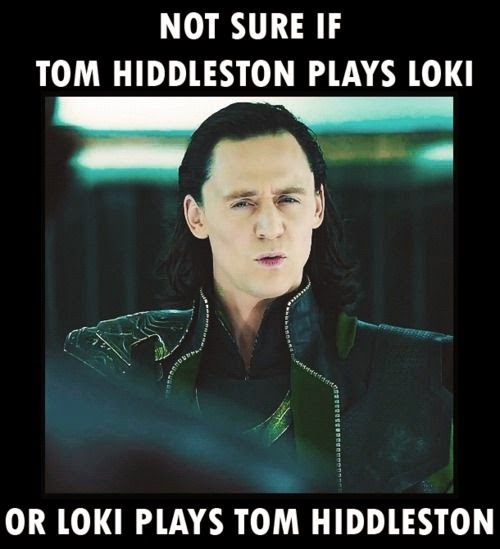 Dwarves are usually confused. They wonder what it is that brought them here in the first place. 8:20 PM. Father sees off the dwarves and Karnilla to their own realms. Mother asks me to behave for at least a day without annoying someone. 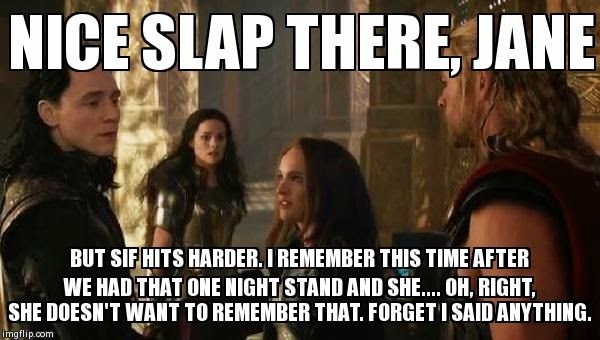 Thor asks if I had fun talking my way out of trouble. Sif walks out, looking my way before she goes, and she seems flustered. Volstagg hits me in the nose. Ow! What was that for??? Oh, right, calling your kids rock trolls. Volstagg stomps off. I dust myself off. Could have been worse. At least it wasn't Surtur hitting me. 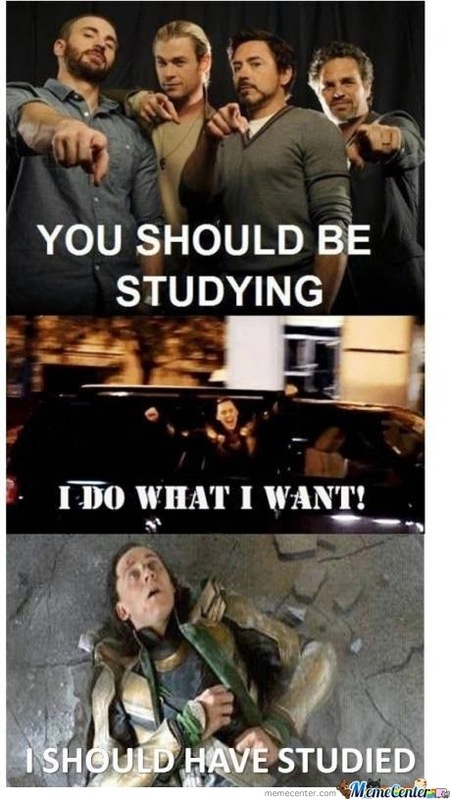 Loki is one of my favorite villains. 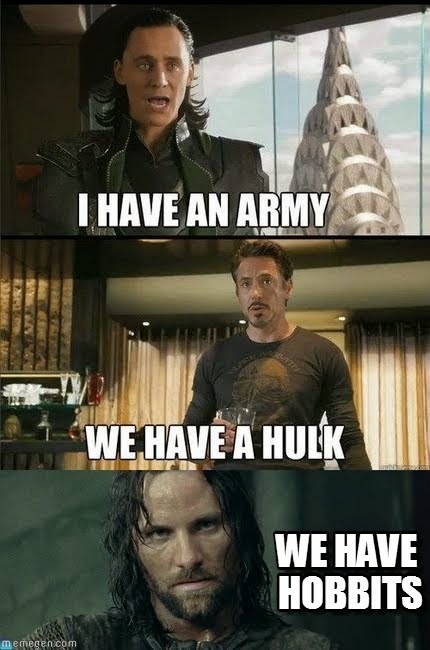 He needs his own movie! 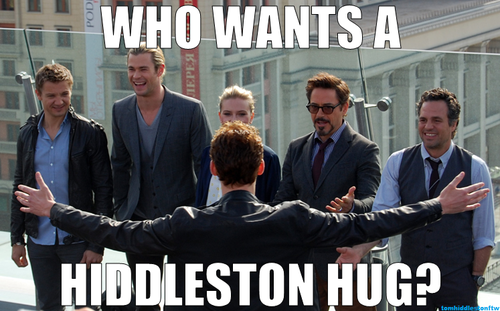 Hiddleston owned that role. This post was just the best ! 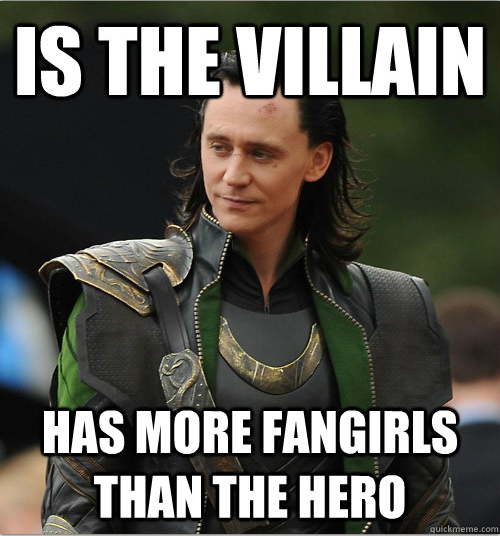 He's a villain, but I still love him. You have to feature him mo0re often! 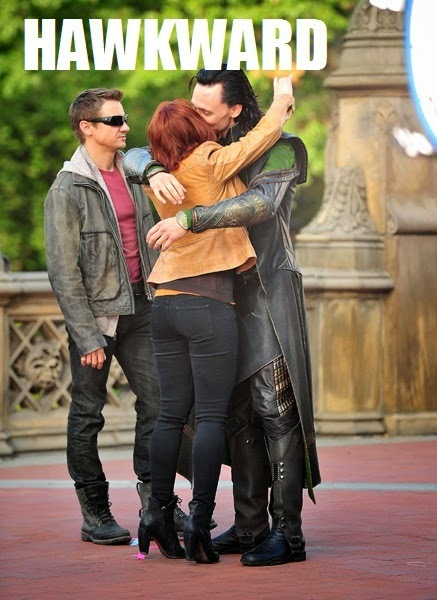 If Hawkeye doesn't kill him for putting his hands on Black Widow, that is. The starting lineup of the Cubs? 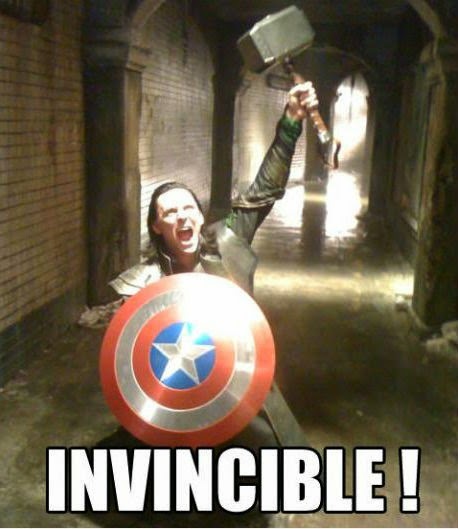 Loki's behind that? Well, darn! I misread 'trickster' as 'hamster'! @Diane: kittens and puppies are much cuter, huh? 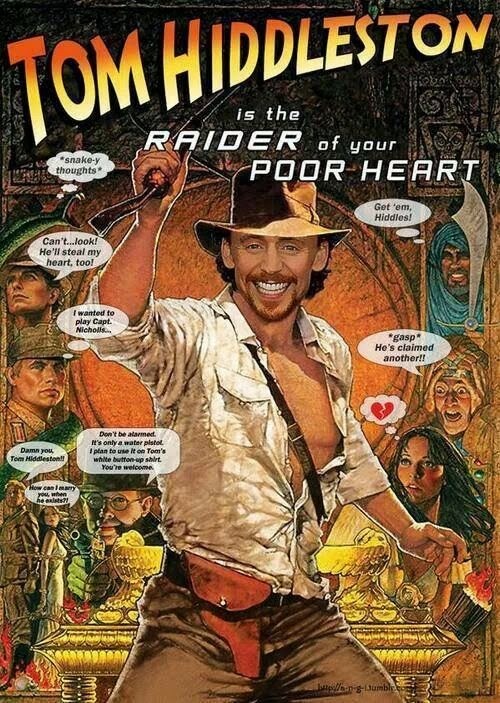 @Auden: Loki as the protagonist would be fun! @Cheryl: not had enough sleep, have you? 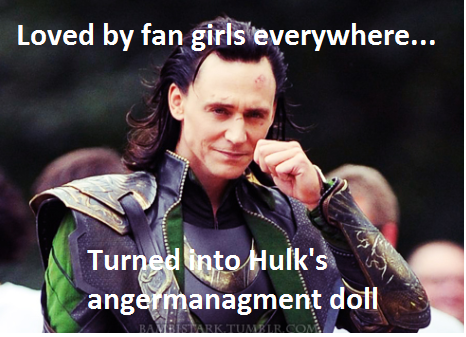 I like Loki but I laughed hysterically when the Hulk threw him around like a rag doll. I cracked up over the starting line up of the Cubs ! 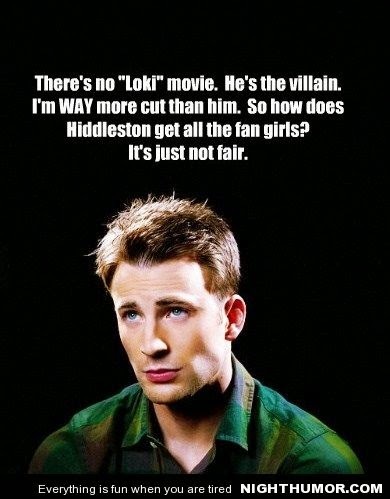 Well everyone loves the bad boy, right ? 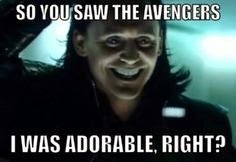 Thor is way better, cuter, and hotter. Who Invited Ethan To The Wedding?